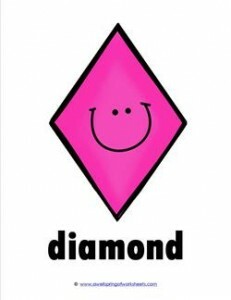 The smiley face is back again, but this time on a hot pink diamond plane shape card. Post this one with all the rest of this collection and watch your kids start smiling, too! Please go to this page to see all the plane shapes shape cards in this set.